The project presents a plausible future vision for the underprivileged female fishery communities of living in coastal India. 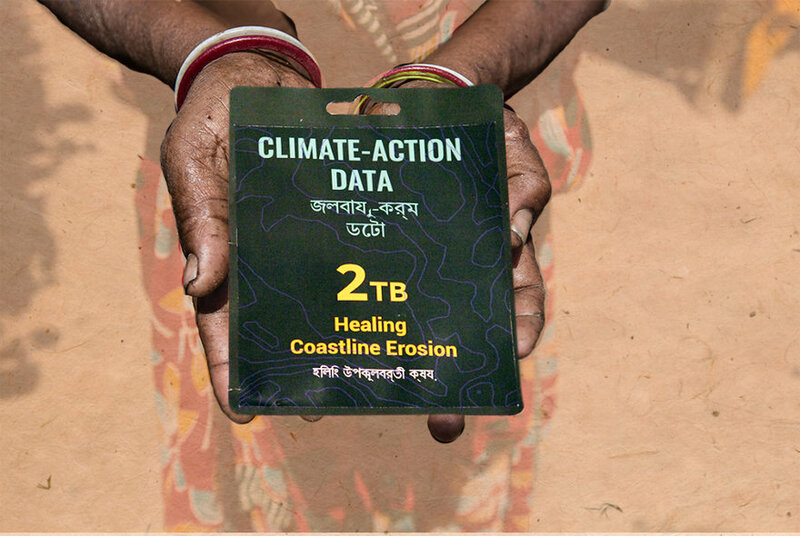 It speculates the impact of climate change on their livelihoods and how it causes them to assert their agency; subverting traditional norms and hierarchically defined roles. In this situation, Rather than being a passive receiver of the climatic change, they foresee an opportunity in the case. They have not only had expertise in fish trading but also in their local ecosystem: they have been well positioned to observe and record environmental change for generations. The female fishing community develops the initiative to collect and trade this knowledge. They become traders of 'Climate-Action' data, vending their generational understanding of dealing with the climate change to the world. Through this offering nuanced insight into changes occurring locally, society can be made climate resilient at the global level. 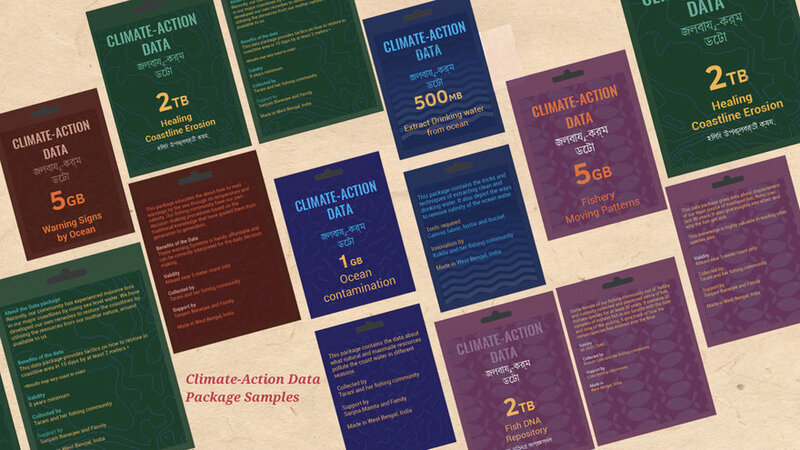 Collection of data packages from this setup exhibits their interpretation of the data world interwoven with indigenous knowledge. It intends the plausibility of this data as a game changer in the dynamic arena of climate change and environmental science. To safeguard their Indigenous learning, they begin to quantify their expertise and package it to enter the trading market. The intention of concealing the understanding is to emphasize the need for prior and informed consent and benefit sharing to the world.Which often exploited for profit without consultation with communities knowledge in the past. Though the endeavor has been embraced by many globally, it faces opposition from a faction of men and old women in their community. The group argues that participation in such an enterprise threatens the community's social and economic fabric existence. The project interrogates the women's participation in leadership, decision-making while climate policymaking. Female Fishing community representation around the world could be central in delivering both successful climate action and sustainable development. The project is an outcome of the "Future of the Domestic Landscape" course, critical design project. The project interrogates the women's participation in leadership, decision-making in climate policy making process. 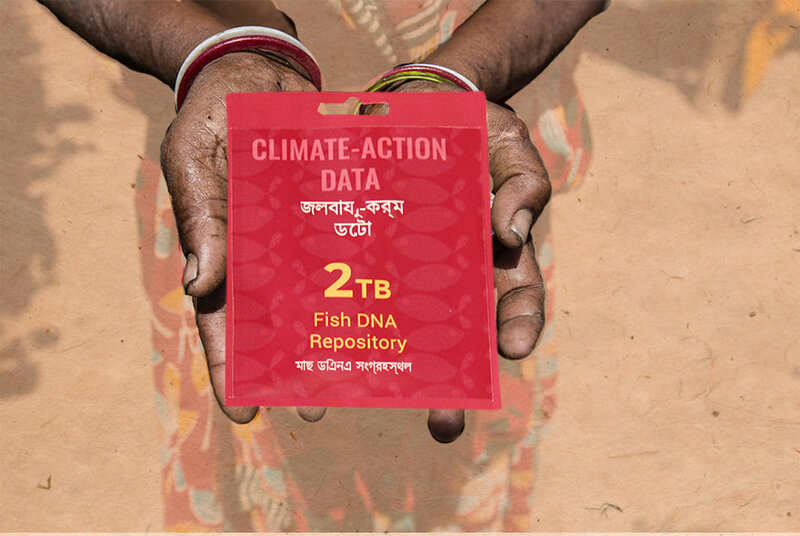 The project takes a critical view towards current under-represented and marginalized fishery communities which are affected by climate change. It identifies their strengths and offers them an alternate source of livelihood in a changing world. It explores alternative ways in which women can contribute to understanding and adapting to climate change. The project presents a fictional future vision for the underprivileged female fishery communities living in the coastal regions of India. It speculates the impact of climate change on their livelihoods and how it causes them to assert their agency, by subverting traditional norms and overturning hierarchically predefined roles. 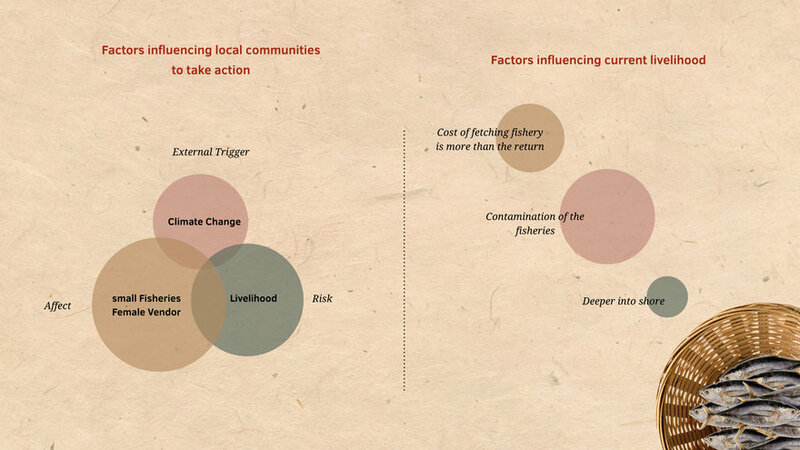 Rather than being a passive victim of climate change, fishing communities foresee an opportunity in the situation. Dwelling in their competence, they not only have expertise in fish trading but also have strong knowledge in their local ecosystem; they have been well positioned to observe and record environmental change for generations. For these rural and indigenous peoples, local knowledge is fundamental aspects of day-to-day life. This knowledge is integral to a cultural complex structure, which can play the vital role in environmental development because of their traditional experience and practices. They develop the initiative to collect and trade this knowledge. The female fishing community becomes traders of 'Climate action' data, vending their generational understanding of dealing with climate change. Offering nuanced insight into changes occurring locally, society can be made climate resilient at the global level. 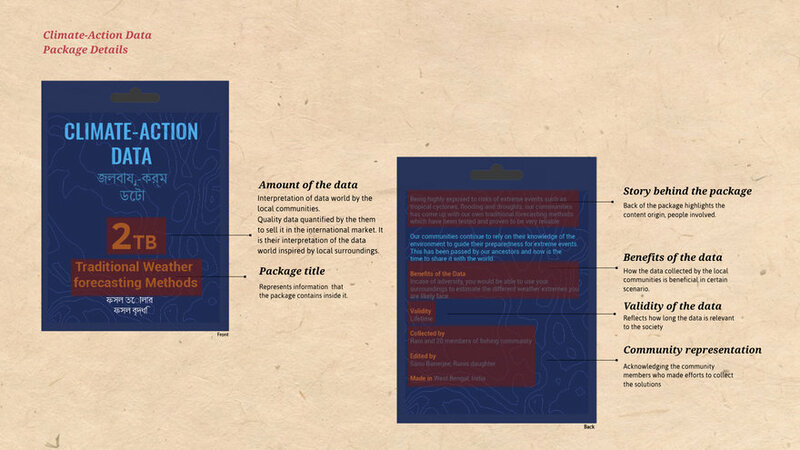 Collection of the hypothetical data packages from this world exhibits their interpretation of the data world interwoven with indigenous knowledge. It intends the plausibility of this data as a game changer in the dynamic arena of climate change and environmental science. For them, The information holds strong potential to reshape the policies at the global level through which it helps society to deal with climate changes and prepare for the future. 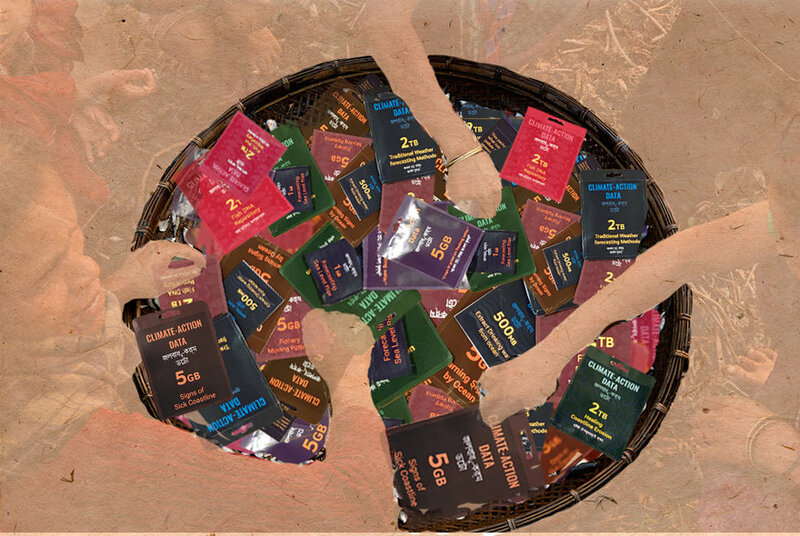 The information is protected inside the data package by them intentionally because often the indigenous knowledge has been exploited for profit without consultation with these communities. There is a need for the protection of their knowledge from inappropriate use, emphasizing the need for prior and informed consent and benefit of sharing. It calls out to build an Intellectual property framework adapted to the indigenous culture. 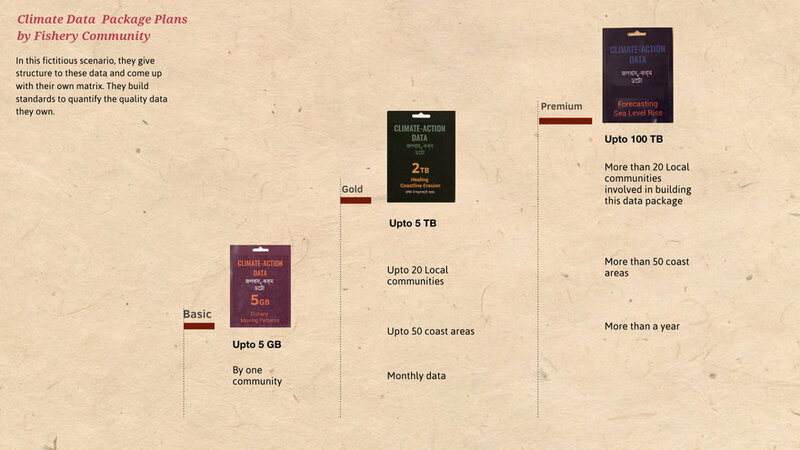 Even within the different communities, access to knowledge may differ. Some types of experience might be restricted to specific individuals and families. There is also the knowledge that the locals may want to keep for themselves. It is essential to understand the different types of education, and both the individuals and community right to control access. The project resonates with stories of other marginalized communities in some way or the other. In the world of change, marginalized women populations are exposed, and sensitive to climate change impacts due to their resource-based livelihoods and the absence of recognized rights over resources contribute to their vulnerability to economic and social structures, that are exacerbated by climate change. Despite their high exposure and sensitivity, local coastal communities are actively responding to climate change. The project calls out the need to preserve, protect the women rights and promote the cultural heritage and knowledge. The indigenous, local, and traditional knowledge systems and practices are a significant resource for adapting to climate change. Our society should build a system where current systems tie up traditional systems of governance and social networks reinforce the ability to respond collectively to change and develop resilience. To develop the project, Marine scientists at Umea University, Coastal communities on Facebook, students at Umea Institute of Design were sought out. The project began with grasping people's reaction to the climate change in the future. 25 Students from different nationalities and countries at Umea Institute of Design were given a journal to fill in, the questions directed towards putting them into hypothetical climate change scenario and how would they design their world in that situation. To my surprise, when handing over that journal back, informally participants told me they are never going to get influenced by it. That made me wonder about people who are getting affected by the climate change the most. Further, during my desktop research, I started looking into people living on the coast and reached out coastal communities through facebook. Through that, I assimilated livelihoods of the fishery communities are getting affected because of rapid climate changes. Further, I found out that women in fishing communities often are unrepresented not only in developing countries but globally. From the stage, the Project directed towards giving identity to marginalized fishery women living on the coast. A workshop was conducted with four design students to ideate and brainstorm on how to represent the women from these communities. They were given fictional coastal newspaper as a probe related to the effect of climate changes on the coastal region. I directed the project in identifying their strengths in the changing world of marginalized fishery women community. I invested time in reaching to communities living on the coast of India and understanding the current local scenario, where the abundance of traditional knowledge which is neglected. Also, for the communities climate change was nothing new, they have come up with their ways to adapt to it was evident during the conversations with locals. I saw an opportunity to tap this intangible knowledge wealth. 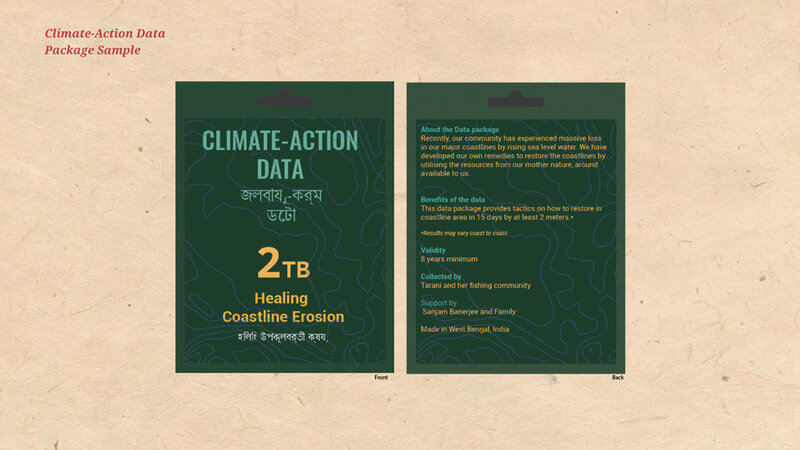 In incubation phase of my design process, I generated the idea of selling climate data, which gives solutions to the current and future climate-related challenges by local women fishing communities.Post this phase, I got in touch with Marine scientists at Umea University Marine Science department, to validate the relevance of the data fictitious data packages titles. The feedback I got was they would be interested in getting the data as it would influence a lot of things in environmental science. P.s.Improvement in the videoDue to technical challenges certain aspects of the video are not addressed, Voice over of the video and visualisation needs to be further worked upon.